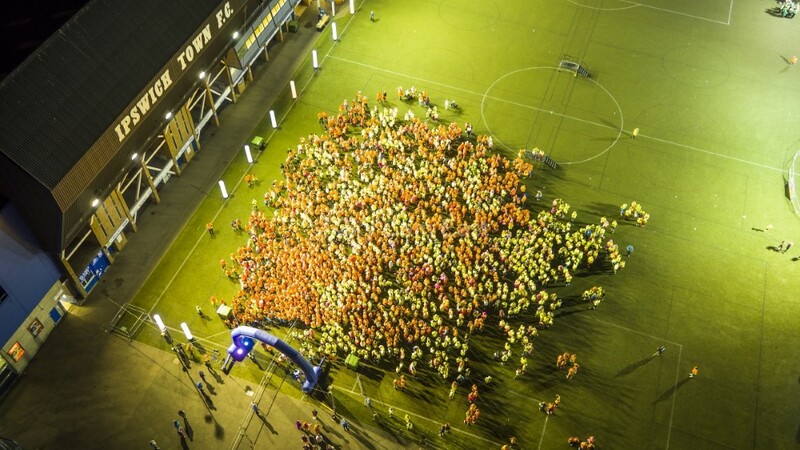 We were invited to provide aerial video and stills for the Ipswich Midnight Walk 2016 – which raises money for the fantastic St Elizabeth Hospice. 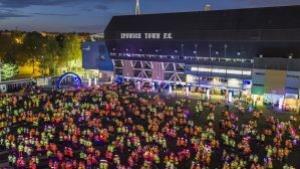 This was to celebrate ten years of the Midnight Walk in Ipswich. This presented a number of significant challenges. It would be night time – most CAA permissions are only for daylight hours, it would be dark – photographically testing, it would involve a crowd – more CAA regulations and it would be at a football stadium – a restricted flight area. Determined to achieve this flight we set about upgrading our CAA ‘Permission for Aerial Work’ to include night flights. This involves several pages of detail added to our operations manual, explaining all the new safety features and procedures that night flying involves. A well lit landing area, strobes on the air-craft, extensive risk assessments etc. With the new accreditation accomplished we next opened a dialogue with Ipswich Town Football Club. After submitting risk assessments we got clearance but had to ‘enable’ our aircraft. Our particular machines will not fly near a ‘no fly zone’ so a number of email exchanges took place to remove the restriction. Finally a pre-flight survey to establish flight paths that do not take the aircraft directly over the crowd and configuring the cameras to cope with low light. The start of the event is designed to show off the colourful illuminated head gear worn by the walkers. So all the surrounding lighting is switched off – and it fell very dark. Sadly we failed to accommodate this and consequently some of the footage is not great – it’s included in the film in any case. Over 2,000 walkers took part. The atmosphere was superb as always and thousands of pounds was raised the precious hospice…. To find out how Sky Cam East can provide your aerial imaging needs, please contact us. Roof Surveys - Drones or Scaffolding? Roof Surveys – Drones or Scaffolding?